Pennsylvania's Department of Conservation and Natural Resources (DCNR) just announced its awards for their 2010 Community Conservation Partnerships Program Grant Program. 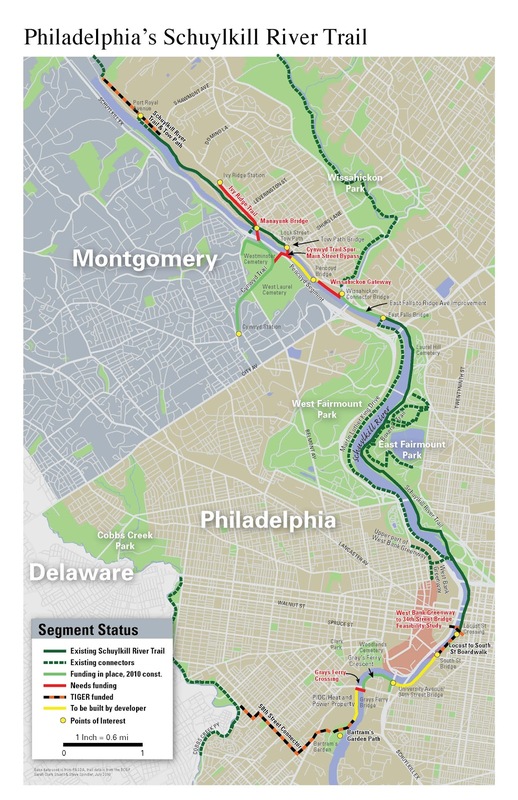 Two grants will fund planning and feasibility studies for several particular gaps identified by the Complete the Schuylkill River Trail campaign: the Manayunk Bridge & Ivy Ridge Trail (combined) and the West Bank Connector (between the West Bank Greenway, South Street Bridge and 34th Street Bridge). 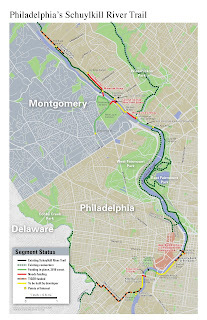 The Manayunk Bridge/Ivy Ridge Trail study will be conducted by the Schuylkill Project. The West Bank Connector study will be done by Schuylkill River Development Corporation. These particular DCNR grants are matched with funding from the William Penn Foundation. The studies are important milestones because they will qualify these SRT trail segments for construction. Pennsylvania Environmental Council will prepare a master site development plan and conceptual design for the development of approximately 2.2 miles of trail on Spring Garden Street connecting the East Coast Greenway through downtown Philadelphia to the Schuylkill River Trail and Delaware River Trail. Clean Air Council will prepare a feasibility study for the development of the Cobbs Creek Connector Trail on the East Coast Greenway between 75th and 84th Streets, connecting the John Heinz National Wildlife Refuge, Fairmount Park, Philadelphia and the communities of Colwyn, Yeadon, and Darby, Delaware County. Delaware County will prepare a comprehensive recreation, open space and greenway plan.